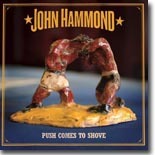 Veteran bluesman John Hammond pushes the envelope with a collaboration with blues hip hopper G. Love ... and it works. Push Comes To Shove is this month's Pick Hit. Former Persuasions singer Jerry Lawson teamed up with his new vocal group, Talk of the Town, for an absolutely wonderful self-titled disc. It's this month's Surprise CD. We Flashback to take a look at the impressive catalog of the underrated Detroit guitarist, Robert Noll. Our What's New section features numerous new releases, including discs from Dave Gross, Ana Popovic, Gina Sicilia, Mem Shannon, Dave Arcari, Joan Armatrading, Elvin Bishop, Peter Karp, Blue Voodoo, JB Bigham (aka The Soul of John Black), West of Memphis, and more, plus a look at a book on New York blues by Adam Gussow.